It’s no secret that the accounting field can be quite competitive, usually with many applicants vying for each valuable open position. To make the most of your professional achievements, your resume needs to set you apart from the crowd. Every jobseeker wants his or her document to make the callback list to land the interview. High-quality, professional accounting resume templates can make all the difference on your path to a fulfilling new career in accounting. Not only can a thoughtfully crafted template remind you of any information gaps to fill, it unites your unique accomplishments with stylistic coherence, and adds visual appeal. Why Use Professional Accounting Resume Templates? Why should a jobseeker choose to use professional accounting resume templates when generic bullet points can easily list recent work history? Recruiters must process so many resumes from so many applicants, they usually spend as little as six seconds scanning each one before deciding whether or not the applicant is a good fit for the open position. We’ve gathered all of our most popular templates in one convenient place, so you can easily see what is working best for others at any time. This is a great place to browse if you want to see an entire collection of different styles that all work well for a wide variety jobseekers and career fields. 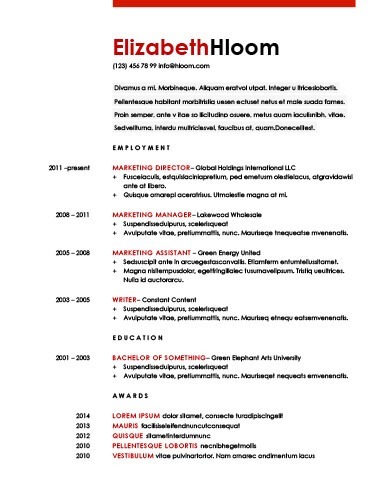 A two-page resume is usually required to list even the basics if you are experienced in your field. For jobseekers with at least 10 years of accounting work history, it can be difficult to find professional accounting resume templates that meet your needs. Choose this longer form, so you can do justice to your professional achievements without sacrificing white space or visual appeal. For a new twist on the basic resume, check out our modern professional accounting resume templates. Modern layouts are perfect for recent graduates applying to newer companies or anyone who wants to breathe new life into an existing resume. They offer an innovative take on professional documents through pops of color and creative fonts as well as unique layouts. A cover letter is not just a good idea; for some employers, it is a requirement. A thoughtful and well-written cover letter demonstrates your communication skills long before your interview. By using a template paired with a cover letter, you can ensure both documents share the same style with consistent tone and stylistic elements. Your resume is a tangible personal representative that must advocate for you long before you meet your hiring manager in person. Always consult a good source of resume writing advice to ensure that you follow accepted protocol and include all the pertinent information. The following subsections are part of well-rounded professional accounting resume templates. Email address: Use a professional, simple email address. Create a new one for the purpose if your personal email address would be unprofessional or distracting. Remember to check it often. If you struggle to put together a resume from the professional accounting resume templates, you can try a resume builder. In three easy steps, you can create an individualized resume with all of your details formatted perfectly. It may also be difficult to decide on the best template for your career path and professional history, but using a resume builder can help match you to the best template for your specific situation. In addition to using the builder, you should peruse these basic resume writing rules to help you put that finishing touch on your resume.